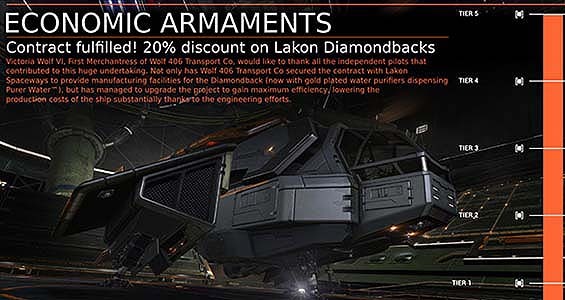 Get 20% discount for Diamondback! Get your Dimondback Explorer at Hamilton Gateway today with a hefty 20% discount! 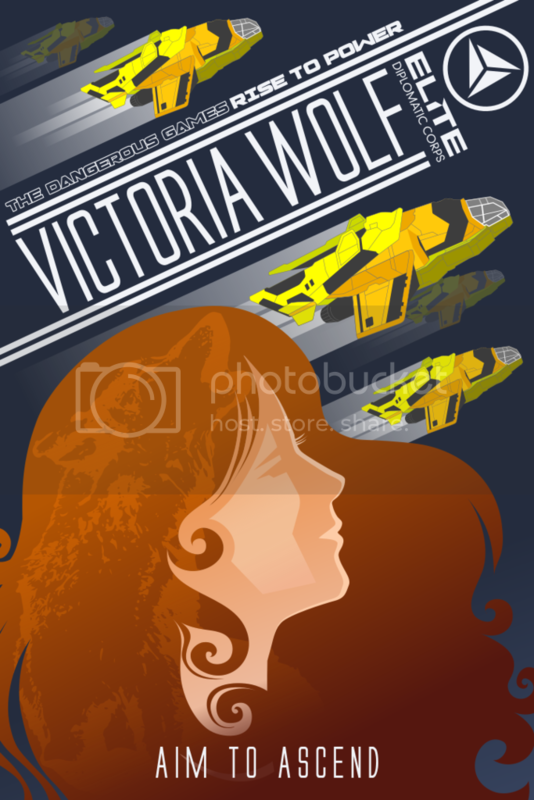 All more reasons to visit Wolf 406, learn more about Victoria Wolf and taste that amazing Purer Water(tm)!  Listed on the Alioth stock exchange and member of the Alioth 1000 Index Wolf 406 Transport & Co has been a solid investment for generations. It is well known for it's support of the academic community and supporting the University of Wolf 406 with donations for the promotion of economics, astrophysics, engineering and material science. 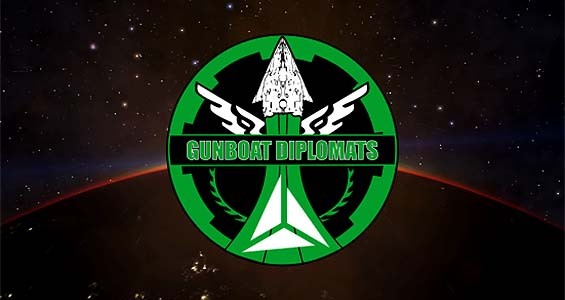 The Dumbbell project is an initiative started within the Alliance Elite Diplomatic Corps during April 3301, after the Alliance of Independent Systems announced their colonization program. The initial scope of our project is to provide good colonization targets within the Dumbbell Sector and to build on existing lore. Over time it has developed into a much larger goal - complete survey of the sector! The end result will be a list of potentially interesting or colonisable worlds for the entire community to examine and utilize for future reference. 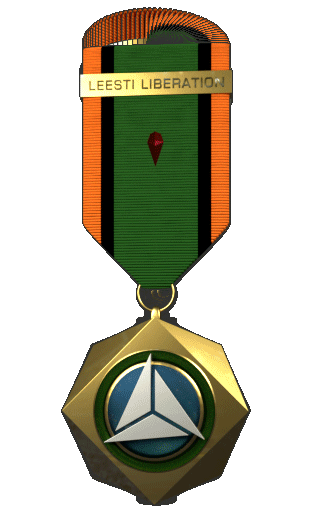 Join one of numerous combat wings of your choosing withing AEDC and defend freedom with force if necessary. If diplomacy fails we will do everything within our power to protect Alliance interests and if that means taking up arms - so be it. 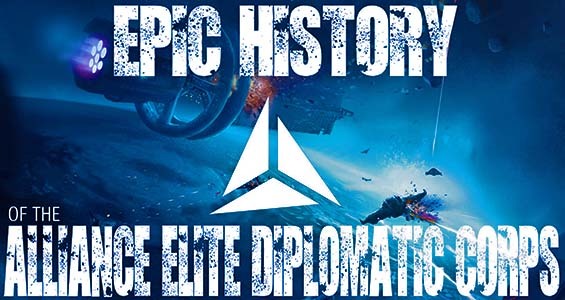 Relying on cooperation, volunteers, contractors and mercenaries Alliance Elite Diplomatic Corps ensure that no negotiation will come under a threat of violence. Our expert negotiators field vast array of armaments to deter any attackers no matter of their allegiance or capabilities. If you employ AEDC experts as your negotiators you can always rely on highly professional peacekeeping force with cutting edge tactics and technology. Join AEDC Combat Units today and see the galaxy! Medical insurance, housing and combat bonuses included. Rain, sleet or black hole - AEDC delivers. AEDC Trade Fleet is always right on schedule, dependable and highly professional. With pilots that are well mannered, educated and discreet there is no language barriers or misunderstandings regarding laws and local customs. Our extended information network provides real time market feed, latest news, supply and demand changes. With AEDC Trade Fleet at their disposal our clients can get anything, anywhere and anytime absolutely legally. With ensured and well protected cargo there is no safer or more honest job out there. Apply for AEDC Trade Fleet membership today and get a special discount for a latest model water purifier! Register at AEDC forum, this is where activity happens. Apply in Militia thread. This is mandatory to join. 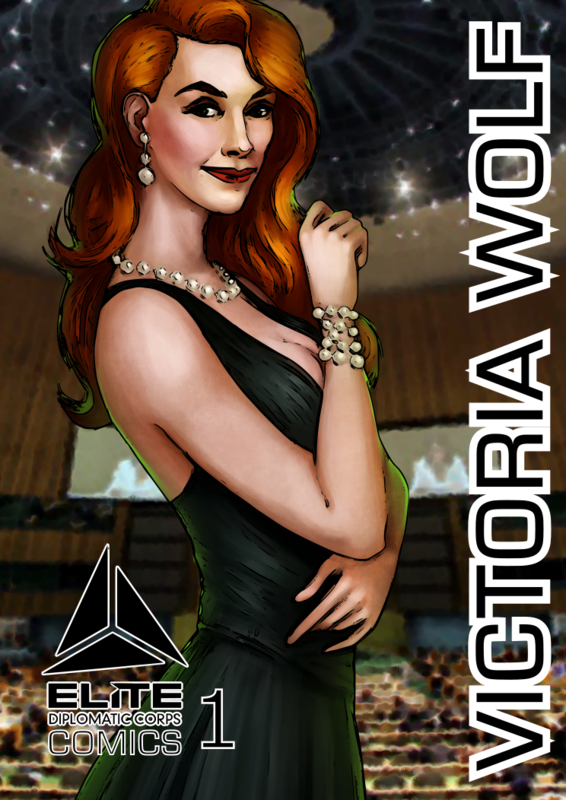 Hello and welcome to the very first issue of Victoria Wolf Comics! 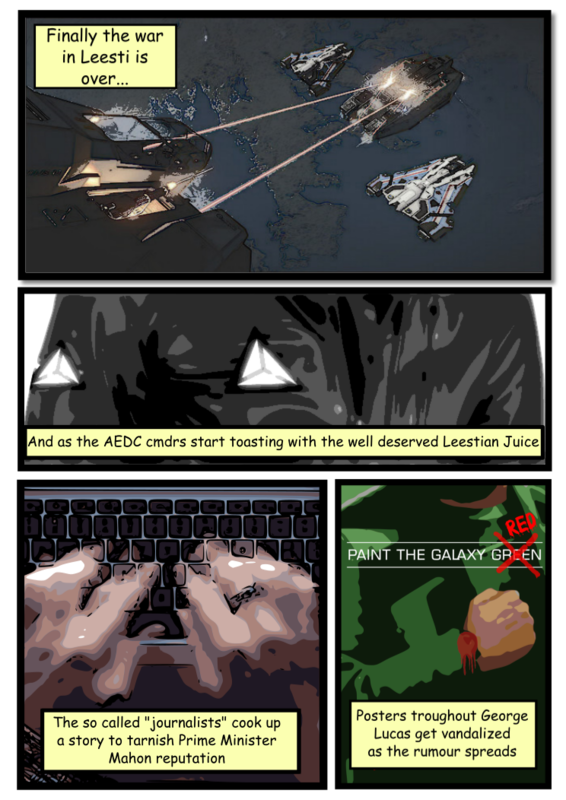 War is over and Leesti is free of oppressive rule thanks to the combined effort of many dedicated Commanders! This is a great day when we made another chapter in the history and a very good one at that. To commemorate that wonderful day medals been issued to reward exceptional bravery of those who fought to defend freedom and prosperity. Goods now flow again, profits already skyrocket and long awaited peace finally established. While we await on the official missive from Victoria Wolf's office and upcoming ceremony here's a propaganda material to remind about all the good work that Alliance and Prime Minister Mahon does for the good of all people across the Galaxy! Down with oppression! Fight for your ILFE! The war has begun! 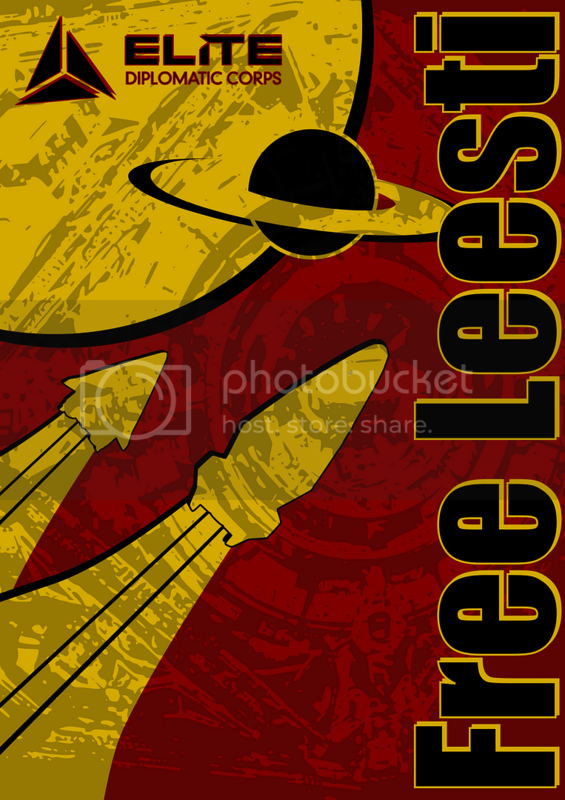 Help Elias Hampton of Independent Leesti For Equality stand up against murderous dictatorship of Justice Party of Leesti and liberate George Lucas station! Fight for what is right! Support ILFE today! Support Alliance! Another wonderful artwork from AEDC community. 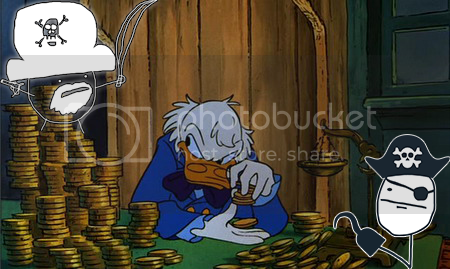 Made by Bfiftytwo. We are planning event for the upcoming holidays. Event include two teams that are competing - "Traders" and "Pirates". One team deliver the goods to a station while other tries to stop it. Event happens in a private group and wings to mitigate instancing. Report Crimes set to off. Initial idea was to test how system will behave if we fill all demand for a station and deliver every kind of goods it buys until there is nothing left in demand. But this is a bit boring for an event so we decided to add a bit of spice to it and turn it into a competition. That would provide some fun PvP with convoys and teamwork while we all can learn a bit more about background simulation. And we want that event to be entertaining so teams intend to be more or less equal with fair chances of defending their objectives. The Dangerous Games have finished. EG pilots showed strong throughout the campaign from the Wildcard Games all the way through the Dangerous Games. Our congratulations go out to them for a well played event. While we did not succeed, we rallied together to make a good showing. 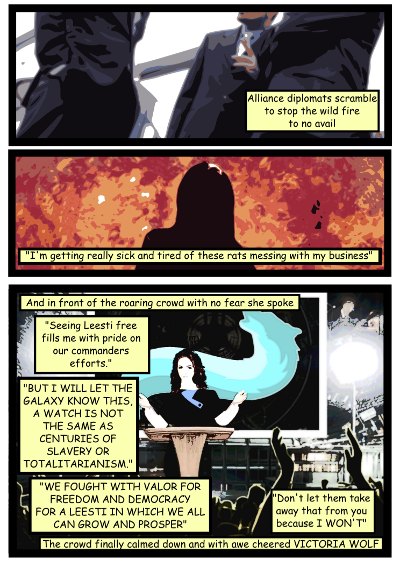 We stood strong and helped put Victoria and the Alliance more into the forefront. Our work in our home space and elsewhere will help continue to make the Alliance stand out. Not only that, but we will continue to have opportunities to put Victoria into the news through our actions. As we look forward to new goals and achievements, our thanks go out to any and all who helped support our bid for Victoria Wolf to become the next Power. Who knows, the Alliance may be the first Superpower to be represented on ships through our decal! As always, fly safe, for the Alliance! AEDC and ESS at Educating Ed! AEDC along with ESS would make appearance today at Educating Ed series. Don't miss it and show up early if you want to participate. You can join our Discord channel to learn all the details and you can find stream HERE. 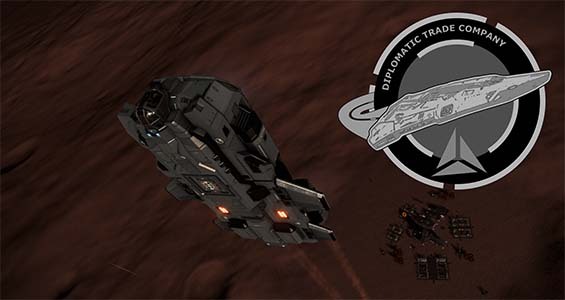 We are the Alliance Elite Diplomatic Corps, a collection of Elite: Dangerous players who have found a calling in supporting the Alliance in any way we can. Our members span the globe and our Discord server is usually full of these players. The atmosphere is casual and light-hearted. Our players are mature and we work well together even though we come from different countries, nationalities and even religions. 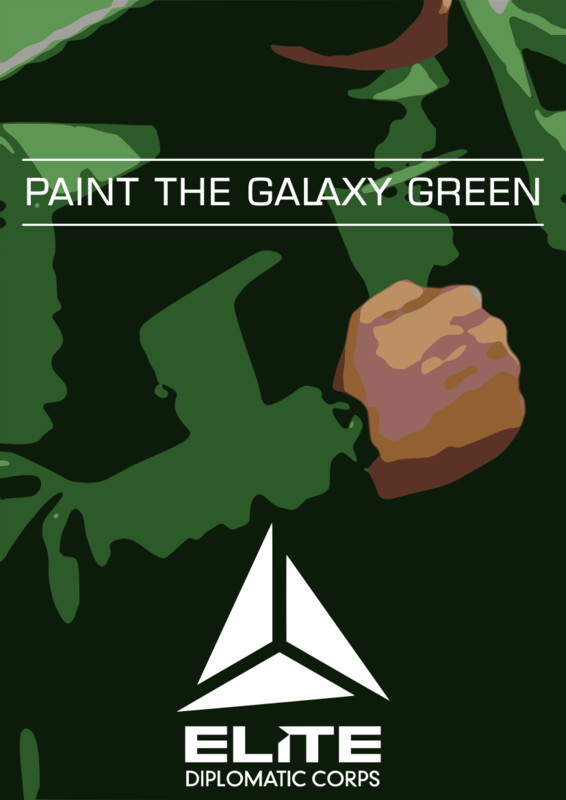 Our main focus is supporting Alliance factions in the Milky Way galaxy by promoting them to ruling status of systems. Our members have been instrumental in welcoming hundreds of systems into the Alliance through this process. We support them through all of the available methods, missions, bounty hunting, civil and system wars, selling exploration data and even trade. Over the course of our time together our members have developed tools that help us note and track influence changes in systems and we have a separate tool that we use to organize operations to accomplish our goals. As staunch supporters of the Alliance, we don't enforce any particular kind of playstyle for our members with the exception that we do not condone piracy or unprovoked aggressive actions toward other players, Alliance or not. We recognize your right to play the way you want to play. If that happens to be supporting what we want to accomplish then we welcome your efforts. 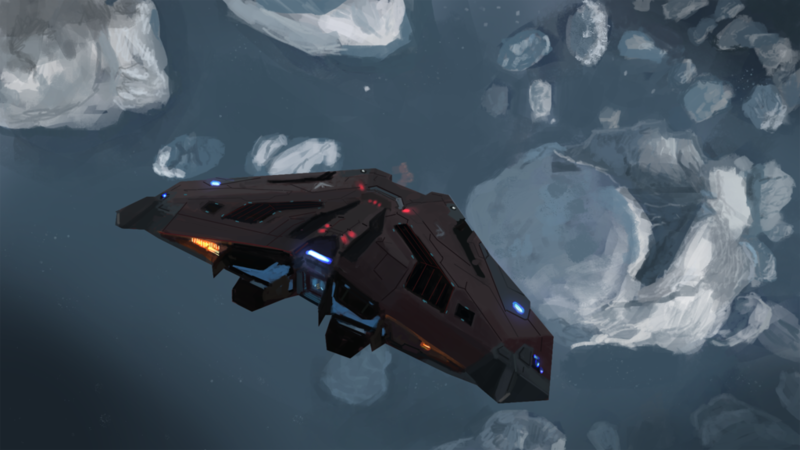 So if you are looking for mature and well-rounded players working to accomplish good things for the Alliance in Elite: Dangerous, please join us! 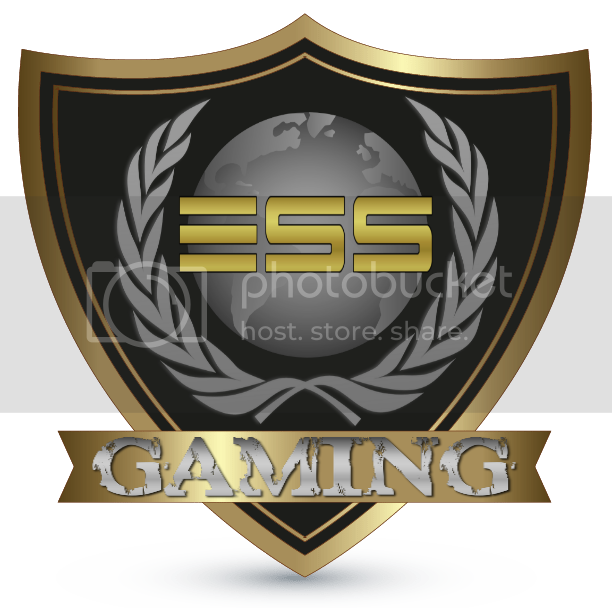 Our Discord server is linked on our website and there is usually someone that can welcome you! As always, fly safe. For the Alliance!